In the online disputes between various ideological trends within the ranks of the Islamic State and its supporters, one claim made by the ‘dissenting’ faction is that the ‘extremists’ exert too much influence in what remains of the Islamic State administration. The dissidents reserve particular ire for the security department (Diwan al-Amn), but another department they allege to be too influenced by the extremists is the media department (Diwan al-Ilam al-Markazi). 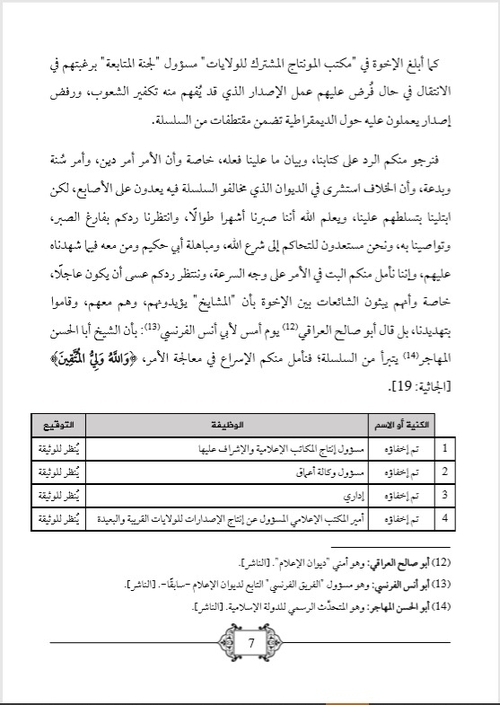 To prove the latter point, Mu’assasat al-Turath al-Ilmi (The Knowledge Heritage Foundation)- one of the dissenting outlets- has released an internal letter signed by a group of personnel in the media department and addressed to the Delegated Committee, which is a general governing body in the Islamic State. The letter was sent in Sha’aban 1439 AH (April-May 2018 CE). In particular, the signatories direct their complaint against Abu Hakim al-Urduni, a Jordanian who once headed the media department. Presently, the media department is headed by Abu Abdullah al-Australi, an Australian who was Abu Hakim’s deputy and is portrayed as being of the same tendency as Abu Hakim. It is alleged that Abu Hakim rejected a media release that included selections from the lecture series issued by the Islamic State after the cancellation of a May 2017 statement that was widely criticized by Islamic State religious scholars as a concession to ‘extremists’ and indulging in ‘innovation’. The lecture series, by contrast, was seen as a ‘return’ to the correct, ‘moderate’ path that had been advocated by the religious scholars like the Bahraini cleric Turki Binali, who was killed in an airstrike before he could see himself vindicated. While rejecting a media release with selections from the lecture series, Abu Hakim allegedly ordered for another release that included some assertions that could be interpreted as declaring takfir (i.e. declaring to be non-Muslim) on the masses of people in general. An application of general takfir on the Muslim masses has always been seen as a benchmark of ‘extremism’ within the Islamic State. Strongly opposed to Abu Hakim were members of the ‘Media Tracking Committee’ (with the exception of another Jordanian called Abu Bakr al-Ghareeb), members of the languages team, and members of the joint film editing office for productions from the various Islamic State wilayas (‘provinces’). From the letter it is clear that the signatories’ complaints about Abu Hakim’s extremist tendencies had been referred to the Delegated Committee but they had not received a response. In fact, Abu Hakim and his supporters were claiming that the Delegated Committee were on their side. 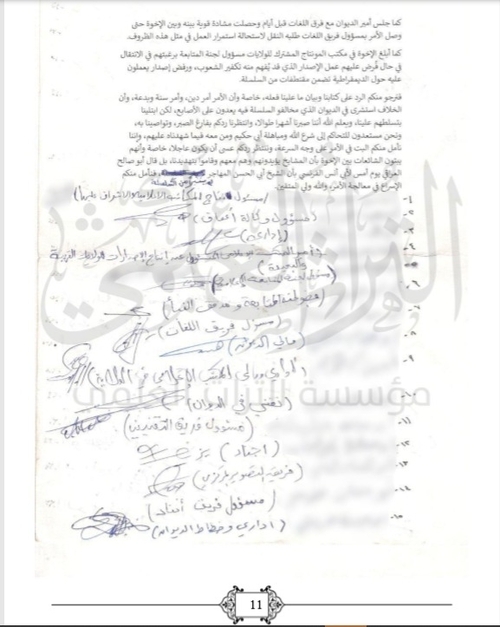 In the end, according to Mu’assasat al-Turath al-‘Ilmi, most of the signatories of this letter were arrested and given the option of returning to media work or taking up military duties. They chose the latter option. Thus, to this day, the media department is seen by the dissenting trend as a den of extremism. Though official Islamic State media releases are sometimes shared in Telegram chat threads for the dissenters (e.g. photo series showing military operations), the general view of the media department is negative. In a similar vein, the episode is indicative in the view of Mu’assasat al-Turath al-‘Ilmi and other dissenters of the problem of extremist influence in the Delegated Committee. On a side note, we learn some more interesting details about various figures in the Islamic State, such as the fact that a governor of one of the Islamic State’s Syrian provinces (Wilayat al-Baraka) appears to have come from the Sinai. Note that all the footnote annotations were inserted by Mu’assasat al-Turath al-‘Ilmi. Any parenthetical insertions in square brackets are my own. Praise be to God who responds to those who prayer, and rewards those who strive, and guides those on the path, and deters the innovators, and exposes the liars, and brings the wrongdoers to ruin. There is no deity but He alone, with no partner for Him. A testimony by which we reach Paradise by His permission. And we bear witness that our Sayyid Muhammad is His servant and Messenger, sent to implement as legislation the rulings of His religion, and guide His addresses, so that His religion should be a manhaj for the Ummah, from the path of which only a grossly erroneous person deviates. May God’s blessings be upon him, his companions and whoso follows them with ihsan on the plain proof. These are the complaints of the brothers in the ‘Central Media Diwan’[i] against the people of innovation with whom the affairs of this Diwan are entrusted to facilitate its matters. It becomes clear in them the extent of the heated conflict between two different manhajs : the manhaj of the Ahl al-Sunna wa al-Jama’a [Sunnis], and the manhaj of the people of erroneous destructive innovations. And the media personnel referred their complaints to the walis of the ‘Delegated Committee’. But the ‘walis of the Delegated’ took no action regarding the complaints of the brothers that came down on their committee, but rather they stood in the rank of the innovators and supported them. 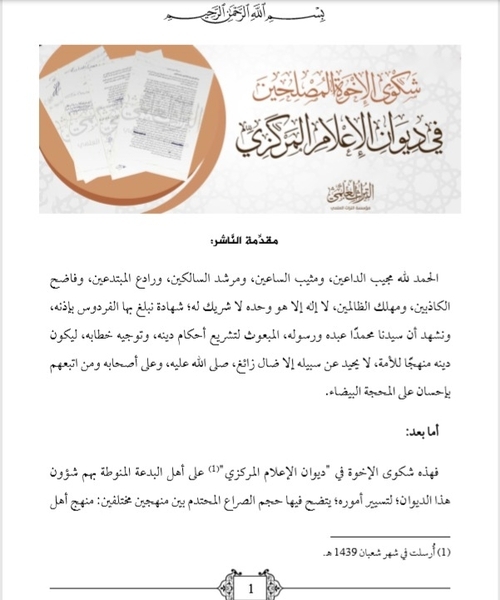 This led the ‘ulama in the Islamic State to issue a prohibition on working with this group holding sway that revolts against the manhaj series, and which spares no effort in obstructing its publication in the official releases: they issued this prohibition in order to put out the innovation, whose custodians in the ‘Media Diwan’ have assumed responsibility for the greatness of its revival, and in order to prevent the strengthening of their power and supporting of them on the basis of their falsehood. Following these complaints, most of the media brothers who signed these complaints were arrested,[ii] and they were made to choose between remaining in the shade of the media under the coercion of the innovators, or they would be dispatched to the army and ribat. So they all left, in order to prevent the manhaj from being distorted and twisted through their participation. And likewise it is to be noted that the brothers referred a ‘case’ against a group of a vile man of the ‘Media Diwan’: Abu Hakim al-Urduni- may God fight him. And that was for their manhaj violations, and their insistence on innovation in religion without a precedent of understanding or knowledge, for they rejected coming down to Shari’i judgement, on the pretext of their affiliation with a ‘Diwan’ while the ‘judiciary’ is no more than a centre, and it is not among its matters to consider the matters of the media! This is so, and we have transcribed the contents of the complaints and corrected them linguistically, and we have omitted the kunyas and names while preserving the assignments to which every signatory to the contents of the complaints was entrusted, along with each person’s signature. And likewise we have put in place a title for it as clarification as it was sent without a title. And God is the guarantor of success and from Him is guidance and the right path, and there is no power or force except in Him alone, the Lord of men and the earth. In the name of God who has forbidden oppression to Himself, and made it forbidden among His servants, and prayers be upon His Messenger, by whom God helped truth come to its own and brought down falsehood, and upon his companions who remained steadfast on his direction, followed his footstep, and repressed every person of innovation and error. And despite the opposition of the brothers in the ‘Media Tracking Committee’ to the expression, and their suggestion to put ‘those elected from the people’ in place of ‘the people’, he nonetheless ordered for it to be carried through as it was without omission or modification, and he held the ‘Tracking Committee’ responsible for the lack of publication of the release at its time or its modification, and the brothers in the committee had previously asked Abu Raghad[v]– may God accept him- about this particular, so he informed them to await the response of the mashayakh to it, and that they should not let it be carried through, and he told them that in his view their conspiring against the Dawla [Islamic State] and its Imam was proven. Then a few days after that he- may God accept him- was killed, so the deputy of the amir of the Diwan[vi] said after the killing of Abu Raghad and his brothers[vii] (quoting the brother Abu Omar al-Britani)[viii] what was its meaning: “There was a black cloud over the Diwan and it has dispersed, and those who were conspiring against us have gone, and now we have excess wealth for food, even if we were to make a barbecue!” And they began after that escalating against us, and trying to pressure the brothers, and oblige us with what is not permitted for us in religion, and on the grounds of obedience to the Imam that we should carry it through. “When the order infringes upon Dawla and our manhaj, we do not hear and obey in that which contravenes them. We are to hear you in administration matters only. And that’s all”- until the mashayakh should determine the issue, on account of the misleading of the people that is in obedience to him, and distortion of the manhaj of the Dawla. So Abu Hakim demanded for the accounts[x] of the brothers connected with the work to be handed over, but the brothers rejected that, in fear of what they might do. And they demanded that the work should proceed as it was without change to it, until there should be judgement on the matter, but these words did not please the amir of the Diwan, so he ordered the technician brothers to stop the ‘Amaq’ server. Indeed in stopping it there is impediment of the interest of the Dawla and making the enemy rejoice in bringing down a media platform, for the internal disagreement, however much it may become worse and grow, must not infringe upon the picture of the Dawla or its media. And this issue was one which the amir of the Diwan and his assistants did not observe, but rather Abu Bakr al-Ghareeb,[xi] who owned the Jaysh Khalid bin al-Waleed (may God be pleased with him) account, got to the point of expelling the amir of the committee and a member of the committee from the administration of the channels that are among responsibility of those two. And the two of them asked him to put them back in to publish the matters of the brothers that reached them, but he did not heed the request, so the two of them resolved the matter by another means, and they published matters of the army [Jaysh Khalid bin al-Waleed: once the Islamic State’s southern Syria affiliate], and despite the fact that the Dawla’s media has not yet been impacted- praise be to God- the matters may develop and grow worse in the coming days (God forbid). The amir of the Diwan also met with the languages teams days ago, and a strong quarrel occurred between him and the brothers, and the matter got to the point that the official of the ‘Languages Team’ asked to be transferred, as it was impossible to continue working in the likes of these circumstances. 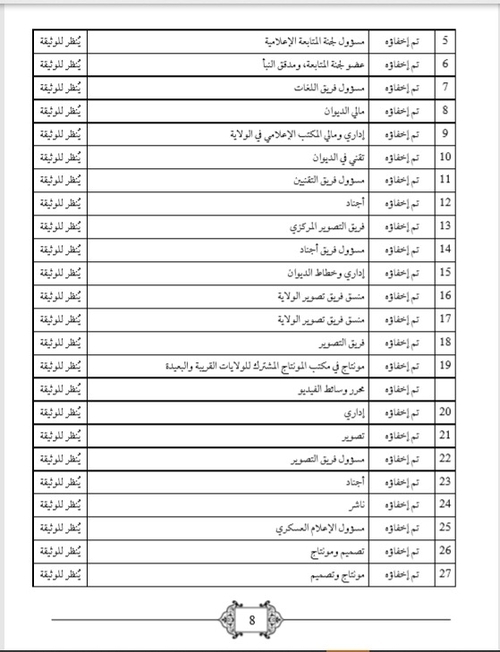 Likewise the brothers in the ‘Joint Film Editing Office for the Wilayas’ have informed the ‘Tracking Committee’ official of their desire to be transferred if the work of the release from which one may understand takfir of the peoples is imposed on them, while an issue on which they are working about democracy that includes selections from the series is rejected. So we ask you to respond to our letter and make clear what we must do, especially as the matter is a matter of religion, and a matter of Sunna and innovation, and the disagreement has become worse in the Diwan whereby those in it who disagree with the series can be counted on one’s fingers, but we have been tested by their gaining of authority over us. And God knows that we have endured long months, and eagerly waited for your response, and urged one another to adopt it, and we are prepared to go to the judgement of the law of God, and mubahala with Abu Hakim and whoso is with him in what we have witnessed against them, and we hope you will judge on the matter quickly. And we await your response. Perhaps it will be soon, especially as they are disseminating rumours among the brothers that the ‘mashayakh’ support them and are with them, and they have threatened us. For Abu Saleh al-Iraqi[xii] said yesterday to Abu Anas al-Faransi[xiii] that Sheikh Abu al-Hassan al-Muhajir[xiv] disavows the series, so we hope you will soon rectify the matter. “And God is the trustee of the pious” (al-Jathiya 19). 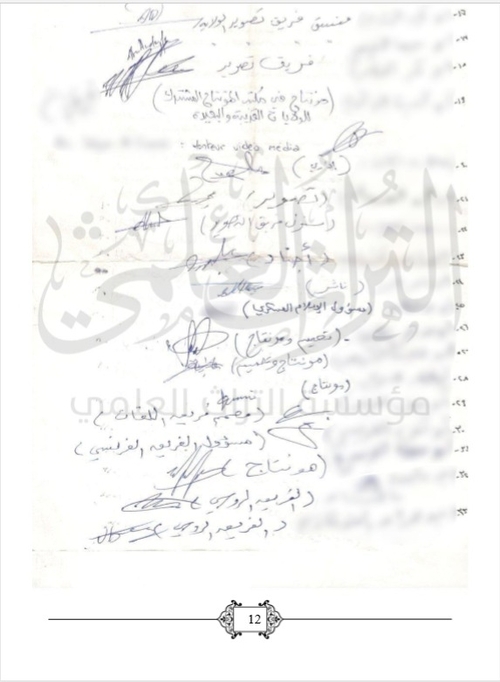 The signatures above are to demand to hold Abu Hakim to account and whoso is with him, and to intervene to resolve the ongoing problem in the Diwan as soon as possible, to avoid division and conflict. [iv] i.e. ‘Knowledge series in affirming issues of manhaj’- 6 audio sessions broadcast through Idha’at al-Bayan affiliated with the Islamic State in the voice of the distinguished mujahid sheikh Abu Muhammad al-Masri (may God accept him) on date Dhu al-Hijja 1438 AH (September 2017). 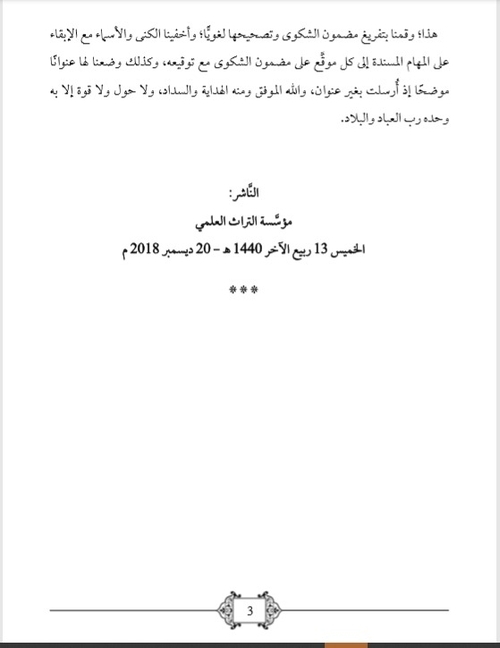 And the foundation published the supplement of it- the broadcast of which was forbidden- and it amounts to 3 sessions, on date 23 Shuwwal 1439 AH (7 July 2018). [v] Abu Raghad al-Da’jani: previously the general Shari’i official for Wilayat al-Baraka affiliated with the Islamic State. [vi] Abu Abdullah al-Australi: previously the deputy amir of the ‘Media Diwan’ and currently its amir. [vii] i.e. 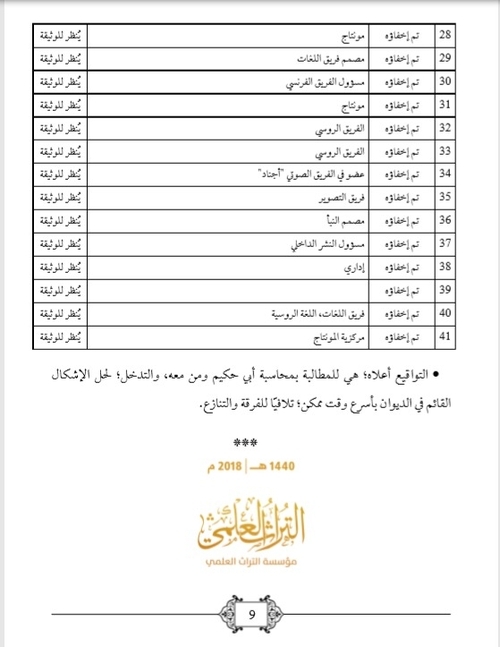 The bombing in which Abu al-Waleed al-Sinawi (previously the wali of ‘Wilayat al-Baraka’) and Abu Raghad al-Da’jani (previously the general Shari’i official for Wilayat al-Baraka), and more than 30 brothers among amirs of battalions and sectors were killed- may God accept them all. [ix] Abu Muhamad al-Qatari: previously official of the ‘Media Tracking Commmittee’ affiliated with the Media Diwan. [xi] The Jordanian who was at that time the official of the ‘Supporting Media Committee’ and a member of the ‘Media Tracking Committee’ affiliated with Media Diwan and close to Abu Hakim al-Urduni.